Human Dynamo Workshop worked on a number of really exciting props and pre visuals for Ghost in the Shell, including these guns and tech pieces featured below. 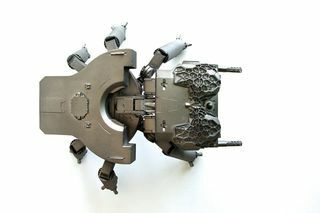 The minitature spider tank was used in pre-visualisation processes for the digital effects teams. Gun fabricated by Human Dynamo Workshop. Guns fabricated by Human Dynamo Workshop. Pre visual for spider tank.